Indians protest against terrorism in New Delhi after the bombings yesterday near a school in Kashmir. 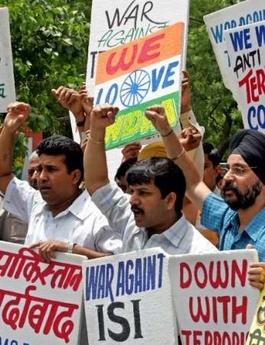 The rally, organised by the All India Anti-Terrorist Front, blamed the attack yesterday in Kashmir on Pakistan-based separatist rebels. An attack on Monday that left 15 dead struck a neighbourhood near an Indian security forces camp in Pulwama, a bustling town just south of Srinagar, the summer capital of Jammu-Kashmir state. Police blamed militants fighting for Kashmir’s independence or merger with Muslim Pakistan. Three Indian security personnel died in the attack. A separatist leader blamed the Indian government. But Pakistan’s President Gen. Pervez Musharraf held Kashmiri extremists responsible and said the violence was unlikely to end soon. A similar rally in Kashmir, sans the professional signs. 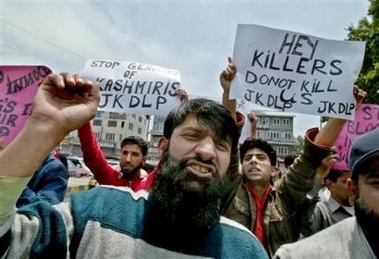 The Jammu Kashmir Democratic Liberation Party shout slogans demanding a stop to the killing of innocent people in Srinagar, India, Tuesday, in another protest against terror. Almost all shops, schools and private offices in India’s portion of Kashmir closed Tuesday to protest an apparent suicide attack from yesterday.